This one's for the under-a-hundred-dollars-a-day crowd. Even in peak season, you can find truly budget accommodations in Puerto Rico and they aren't all bad. In fact, the ones I've listed here range from decent to surprisingly good deals. If you want to enjoy a Caribbean vacation on the cheap without compromising (too much) on comfort, start planning your trip here. Forget high prices; you can book yourself a room at La Caleta Rentals for $100 in non-peak season. La Caleta has over 30 properties, all with a three-night minimum that can be flexible, depending on demand and time of year. So what do you get for that price? Your options range from studios to three-bedroom apartments. All are clean, well-furnished, with kitchens or kitchenettes and separate living rooms in the larger apartments. They also have access to laundry machines if you need them. There are no porters and no elevators; still, it's by far among the best bargains around. A tropical B&B, Casa del Caribe is somewhat dwarfed by its lofty Condado surroundings: the Marriott Stellaris Hotel & Casino is a few steps away, along with some of the hippest shopping in San Juan. But this tiny little inn has a mom-and-pop charm and clean, comfortable rooms. It's close to the beach, is about as laid back as you can get, and even has free parking (although this can be a tricky negotiation into a narrow wedge along the side of the hotel). The continental breakfast only adds to the value. This intimate spot in Ocean Park certainly has a lot going for it. Its six rooms range in price, but you can get accoommodations in their studio apts for under $100/night. Most rooms are furnished apartment style and all have full kitchens, private bathrooms, AC, WIFI, in-room safes, cable TV and DVD players. Some units even come equipped with flat screen TVs, iPod docks, apple computers and Steam showers. For a budget hotel, that's a pretty impressive list of amenities. During peak season, the rates at The Tres Palmas ( or "Three Palms") kicks it off this list. I'm including it anyway because this small inn offers a lot for the money: beachfront location, pool, rooftop terrace with a Jacuzzi, complimentary breakfast, cable TV and a safe in every room (that last one is especially hard to find in a budget hotel). The inn's well-tended grounds and rooms make it stand out as not just an affordable option, but an inviting one as well. One of only a handful of hostels on the island, the San Juan International Hostel offers a truly budget (like $40 a night budget) option for those who don't mind communal living spaces. The cash-only hostel has three four-bed dormitories and two two-bed dormitories. It has a communal kitchen, indoor living room and large outdoor balcony area. A very good perk is free WI-FI for guests. Guests also get free linens and towels. Security lockers are available, but you'll need your own locks. Hot showers are available 24/7. And finally, fans are provided for each bed, but the hostel has no A/C as yet. 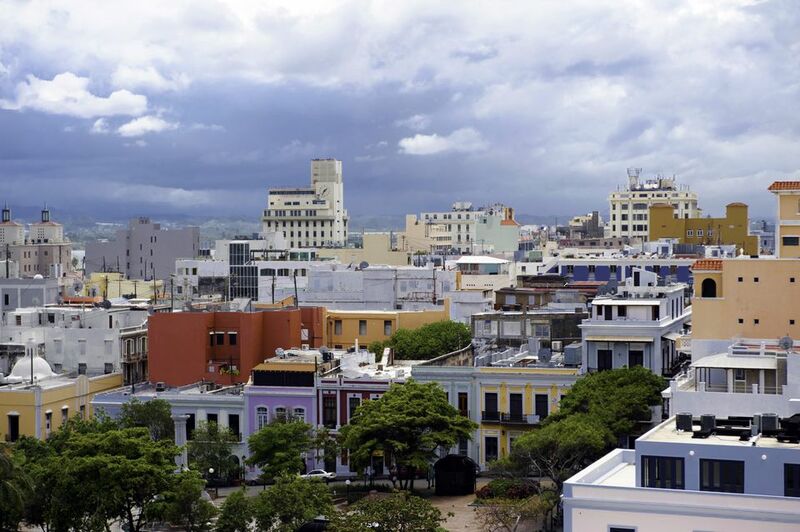 The hostel is located on Calle America in the Santurce suburb of San Juan.